Having climbed five Colorado "fourteeners" in three days, we decided to drive one. Mt Evans, conveniently, has a frayed blacktop ribbon that leads to the summit. We clipped the Toyota into the line and slowly 'scended behind the others. Just below the summit, the laboring parade shuddered and stopped. As is common in the great parks of our nation, it was a wildlife issue. Above us, a bachelor band of sheep trolled for greenery about the rocks. They were comfortable with the thin air at 14,000 feet and were indifferent to the camera fire coming at them from the cars. I added to the volley. Two members of a bachelor band. These were not just any woolly sheep, but a special breed: Rocky Mountain bighorns. Ovis canadensis canadensis is the largest of the American wild sheep that roam the American West. They are a dapper lot, dressed in grey brown with a white rump. Their curled horns--that can weigh up to 30 pounds--wrap around the sides of their heads and give them a distinctive appearance. The nobility of the Rocky Mountain bighorn was captured by Albert Bierstadt more than a century ago. Like much of Bierstadt's work in the American West, his careful use of light adds a romantic element that no camera could capture. Albert Bierstadt's "Bighorn Sheep," ca. 1876-1879. Image from here. As is common with the breed, males and females do not cavort together apart from the rut. Our group of a half dozen or so were rams. Those with developed racks were at least eight years old. We watched them for a time and then, as traffic allowed, moved on. I couldn't help but muse over the close relationship between this stately North American sheep and their Old World relative, the mouflon. According to those who study such things, sheep domesticates we know today were manipulated from the wild mouflon in a process that began some 12,000 years ago. This includes the Awassi, or fat-tailed sheep, regularly herded by shepherds of the Bible. This is the face of their common ancestor. The mouflon may still be found in the Bible Lands today. Image from here. Near the summit the line of cars slowed and stopped again. Again the issue was wildlife, but instead of sheep, it was goats. And instead of a bachelor band, it was whole families. A big buck poses for us near the summit of Mt Evans..
What we call the Rocky Mountain goat, or Oreamnos americanus, is a member of the antelope family. It is not considered a part of the Capra group at all! 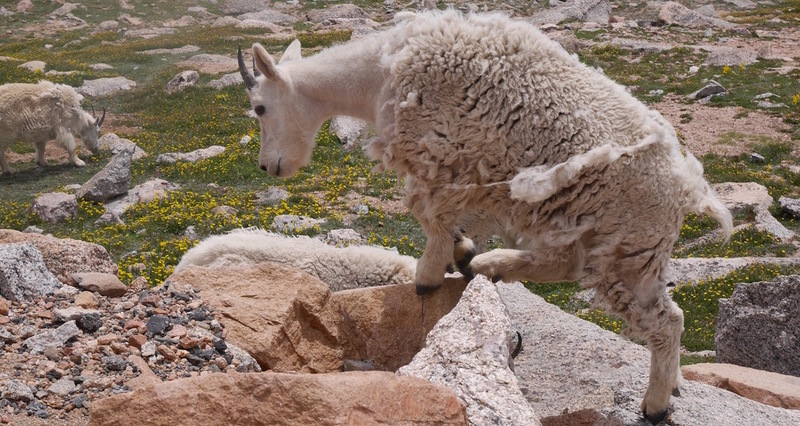 Just as the sea-horse is not really a horse or the mountain lion is not really a lion, the Rocky Mountain goat is victim of the doppelganger effect. It is "goat-like" (and is even described as "bucks" and "does") but different from true goats. Fact is, recent study at the molecular level suggests that the Rock Mountain goat may have a closer relative in the Musk ox! The Rocky Mountain goat sheds its second coat for comfort in the summer months. Anatomically, the difference between mountain goats and true goats boils down to the bone. Mountain goats have thinner, lighter skulls and horns of a different shape (See here for more). Kids playing king of the mountain. Given the prominence of the phrase "sheep and goat" in the Bible, the propensity of contemporary herders to run "sheep and goat" together in the biblical heartland, it is striking to find "sheep and goat" together at the tippy-top of the Rocky Mountains. However, one must be cautious in carrying the analogy too far. While not a fan of any St. Louis team (or Los Angeles, for that matter), I must admit that the Rams have the coolest uniforms in the NFL. Image from here. For more on "sheep and goat" in the Bible, see Oded Borowski's Every Living Thing: Daily Use of Animals in Ancient Israel (Walnut Creek: Altamira, 1998). Also helpful is J. Blondel and J. Aronson's Biology and Wildlife of the Mediterranean Region (Oxford: Oxford University, 1999). I have written elsewhere on the management of sheep and goat herds. See our "The Labor of Animal Husbandry in the Biblical World" in Wineland, Ziese and Estep, eds., My Father's World (Eugene: Wipf and Stock, 2011).